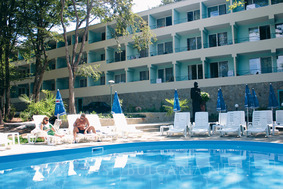 Location: The hotel is based in cool beech tree forest close to the north beach “Atliman”. The distance to the beach is just 200 m.
The apartments consist of a living room, bedroom and two bathrooms with toilets and spacious terrace. They are fitted with mini bar, cable TV and are suitable for a family of four. All double bedrooms have terrace and on suite bathroom with toilet. The rooms are quipped with mini bar, cable TV and an option for additional bed. Car park is available for the residents of the hotel. Wine & Dine: Hotel restaurant accommodates 60 seats in the main hall and has two additional summer terraces. This is the place to try the traditional Bulgarian cuisine and the specialties prepared by our chefs. Hotel Ariana is the right place to spend your holiday with your family. The hotel has on site children’s playground with safety equipment, table tennis, electronic games mini football and billiards. Hotel services: mini bar, beach equipment, laundry and ironing services. Business services: telephone, fax, Internet. Transport services: the hotel has its own mini bus for trips and transfers. Excursions: boat trip, one day trips to Ropotamo river, “Arkutino” national park, Sozopol, Nessebar. Sport and entertainment facilities: table tennis, billiards, mini football, electronic games, children’s playground garden barbecue, newspapers and magazines.